Conservation genetics focuses on understanding the role and requirement of genetic variation for population persistence. However, considerable debate now surrounds the role of genetic factors (as opposed to non-genetic factors such as habitat destruction etc.) in population extinction, and a comprehensive synthesis is now timely. Can extinction be explained by habitat destruction alone or is lack of genetic variation a part of the explanation? The book thoroughly reviews the arguments for a role of genetics in the present biodiversity crisis. It describes the methods used to study genetic variation in endangered species and examines the influence of genetic variation in the extinction of species. To date, conservation genetics has predominantly utilized neutral genetic markers e.g. microsatellites. However, with the recent advances in molecular genetics and genomics it will soon be possible to study 'direct gene action', following the fate of genetic variation at the level of DNA, through expression, to proteins in order to determine how such phenotypes fare in populations of free living organisms. 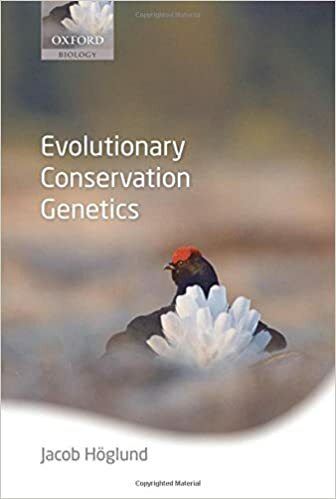 Evolutionary Conservation Genetics explores these exciting avenues of future research potential, integrating ecological quantitative genetics with the new genome science. It is now more important than ever that we ask relevant questions about the evolutionary fate of endangered populations throughout the globe and incorporate our knowledge of evolutionary processes and the distribution of genetic diversity into effective conservation planning and action.